The first edition of the French Surfers Bible came out in 2004 thanks to the initiative and funding of Christian Surfers Tahiti. 6,000 New Testaments were printed. In the years since, they have made their way across France and have proved to be most useful in the start-up of Christian Surfers France and in churches along the coast of France. Several of our friends in the southwest testify that the Surfers Bible played a key role in their coming to faith. We’ve heard similar stories as we’ve traveled around France with the aim of developing CS France as a true national movement. This year, fourteen years after their initial printing, we realized we were distributing the very last boxes of La Bible des Surfeurs and simultaneously recognized that it was also time for a graphic redesign and new testimonies of professional and francophone surfers. We opted to keep the same format, publisher, and Bible translation from the first edition. Though it is a bit bulky for just the New Testament, what was more important for us than a compact size was the ease of reading as most of the French people who are receiving this Bible are encountering God’s Word for the very first time. With large print, a single column layout, and text broken up into short passages with headings, it’s inviting to read. We got updated testimonies from the likes of Eric Arakawa and CJ Hobgood who were already in the 2004 edition, and we added the stories of a number of francophone surfers including Anne-Cécile Lacoste, female world champion bodyboarder in 2015. With pieces of the puzzle falling into place, we turned our attention to the financing of the project. 3,000 copies at about 5€ each comes to 15,000€, a daunting sum for CS France which had about fifty bucks in a dormant bank account a year ago. We launched a crowdfunding campaign in France, dug into our own pockets, and turned to a couple churches we know in the US. God stunned us with a reply from the US within 24 hours of sending out the e-mail—nearly 5000€ already on the way! That put us over what we needed for the down payment, and the Bibles went to print! We received 2,000 copies of the 2018 edition of La Bible des Surfeurs a few weeks before the conference and an additional 1,000 have been shipped to Tahiti. 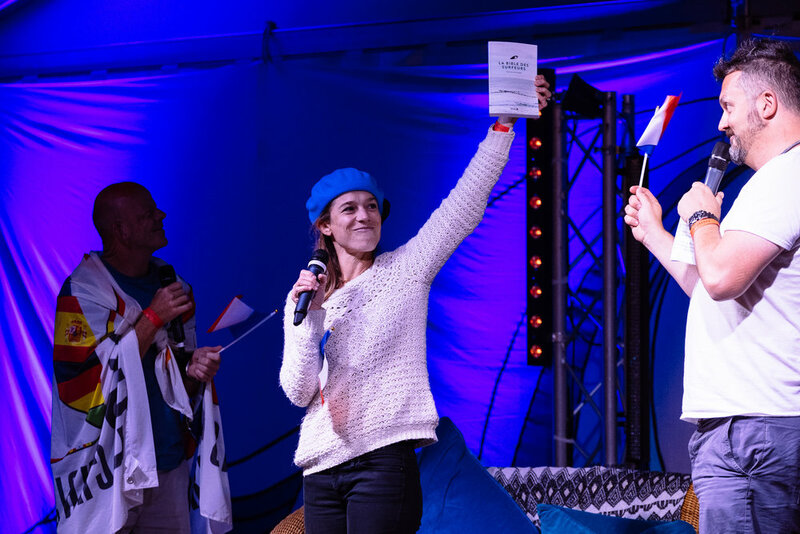 In France, the Bibles have already been put in the hands of surfers on the beaches of Brittany and the Mediterranean through our expanding network of CS France contacts and partners. For further distribution, we have our eyes on other French-speaking spots around the world such as the Caribbean and North Africa. At the current rate, we certainly won’t be waiting another 14 years before we deplete our stock! As for the finances, thanks to the generous attendees at the International Gathering in Hossegor in September and our ongoing crowdfunding in France, we only have 3,000€ left to pay. We’re now praying for that sum and more. With people like pastor Loïc Roué handing out sometimes two or three Bibles a week to surfers he meets in the water, we’ll be reprinting soon! We praise God for the way that La Bible des Surfeurs is helping to fulfill the vision of #everysurfer. Donate towards La Bible des Surfeurs now!